We’ve written about collars and tags for livestock before, but with a new kid on the block we thought it’s time to sort the sausage from the sirloin, so to speak, to help show we’re at the forefront of agricultural research for the benefit of the country. Using wearable technology, we’re advancing the ability to monitor and understand animal behaviour and measure things we haven’t been able to before to optimise livestock health, wellbeing, productivity and efficiency. Here’s a snapshot of our livestock bling. Virtual fencing is an animal-friendly system that uses GPS, wireless technologies and sensors to train livestock to be confined or moved without needing actual fences. Solar-powered smart collars give audio cues to cattle as they approach the ‘fence’ and a small electric pulse if they continue on. Over a short period of time, the cows learn to turn away when they hear the audio (and no, it’s just a beep, not music). . Potential management benefits include better pasture use, protection of waterways or sensitive areas, and reduced animal welfare issues and costs associated with fencing such as labour. If you could try it yourself (go on, we dare you), you’d find it would feel like a ‘tingle’ on your skin because it’s significantly less than the shock from an electric fence. Our global commercial partner for virtual fencing, Agersens, is expecting to release the collars this year. We’ve also built a different type of collar that collects real-time data from grazing livestock to help measure feed intake, and ultimately, production efficiency and environmental impacts. If we could know how much feed an individual animal eats, given the sheer number of animals across the planet, even small improvements in the conversion efficiency of feed into kilograms of beef could have large cumulative benefits. Working with the NSW Department of Primary Industries, designing and building the ‘eGrazor’ system involved lots of watching grass grow, cattle eating, tinkering with sensor devices, data collecting and analysis. 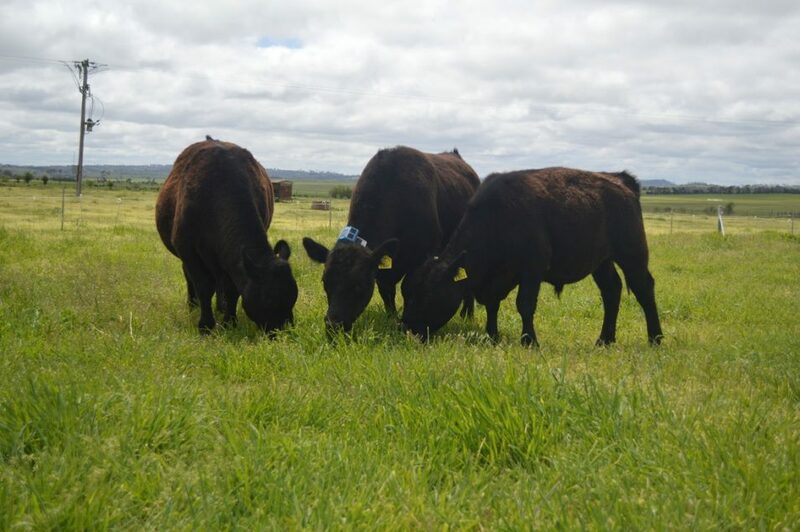 But we now have a world-first behaviour-based method to measure individual animal intake of pasture. These collars are solar powered, contain radio for two-way communications and real-time data recovery, micro SD cards for data storage and a processor chip to control sensor functions (still no music though). We’re keen to talk to potential commercial partners to help bring this tech to market. In the same way that Fitbits log our activity and health, activity trackers could soon help farmers monitor the health and behaviour of their sheep. Consider for a moment that a ewe (you know, a female sheep) can change paddocks 10 times a year, and the feed in each paddock might be completely different (grass, shrubs, harvested crops). Simultaneously, the ewe will be carrying, suckling or teaching its lamb what to eat – prior to four months of downtime before finding a ram and restarting the annual cycle. With approximately 74 million sheep in Australia – and more than a billion worldwide, managing the health and productivity of their flocks is a big logistical problem for farmers. Our researchers are looking to solve this problem by developing the algorithms that will be needed to make practical use of data from activity trackers for sheep based on GPS and accelerometers that measure 3D movement. For our research, this tech is in the form of trackers that sit behind the sheep’s shoulders but commercial on-animal wearables are in development. Which brings us to the latest tech. This time it’s an ear tag and a smart one at that. We’ve started work with agtech company Ceres Tag to develop a new, next-generation ear tag to track and monitor livestock and unlock invaluable data for the livestock industry. It features geo-location for greater traceability and provenance of livestock and will hopefully lead to other applications as well in the future. The aim is not just to save producers time and money in locating and monitoring their livestock but more importantly to help improve management of both livestock and the paddock. The first tags should be ready for trials in 2019. Doggone dingoes – menace or misunderstood? That’s nice! Hope it will soon get in Brazil! We still have lots to do, but we are getting always better!